Description: These fairies aren't completely devoid of magic. They've turned bookish Betty into a fashion diva, and in exchange, Betty's taken these fairies on a wilder adventure than even these sprites could possibly imagine! Instructions: Use your mouse to click on and through the floating hair, clothing, and accessory options for the fairies and their girl. This beautiful creature is under a fashion curse! 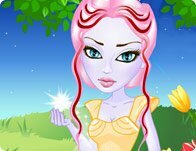 But you can break the enchantment with a fantastic hairstyle, chic dress, and cute charmed bracelets. Dodge, weave, jab, dance and smash! The life of a fairy boxer isn't always glitz and glamor, but it is always a fashionable adventure.